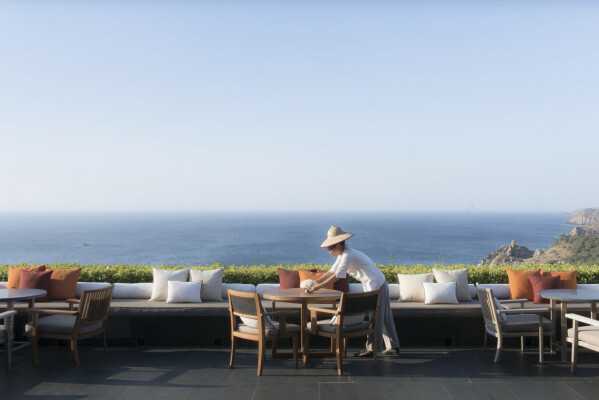 This tranquil and traditional, elegant and delicate contemporary beachside resort is situated in the sinuous seahorse shaped country of Vietnam. 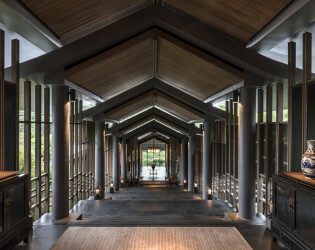 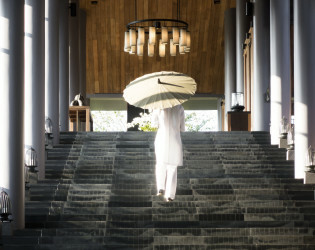 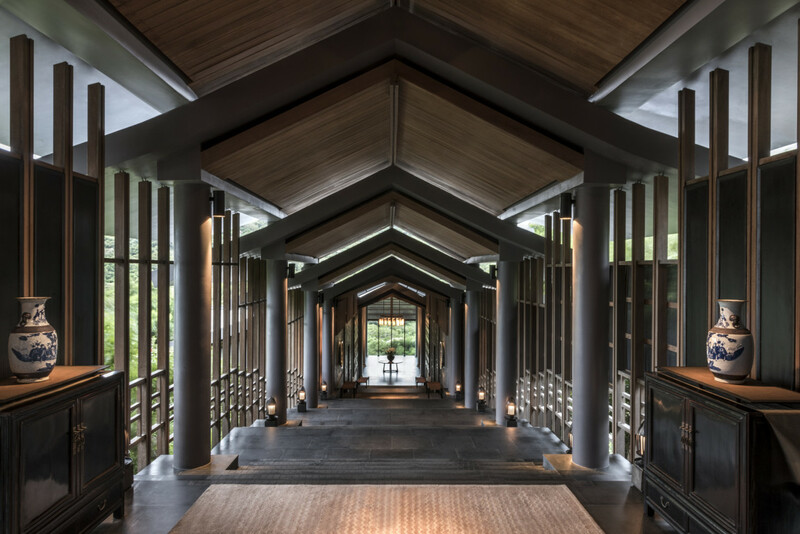 Experience an unforgettable sense of arrival as you ascend a broad bank of stairs to Amanoi’s Central Pavilion. 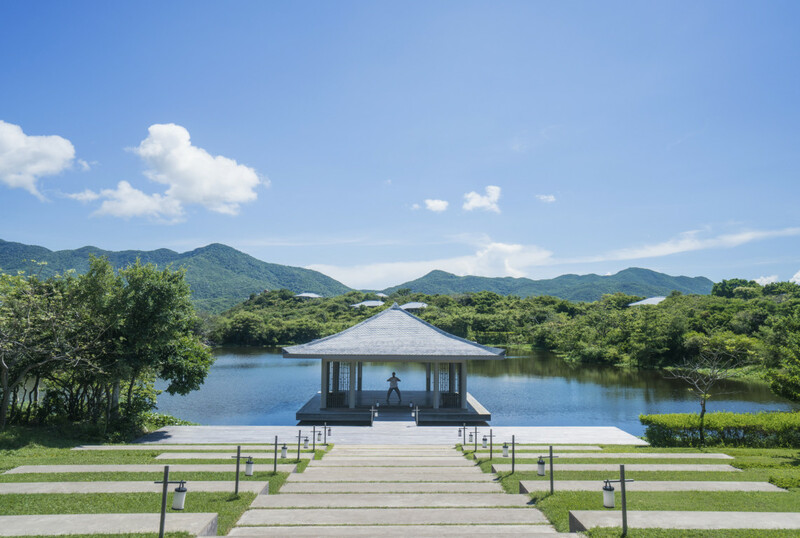 At the apex, the panoramic views of the sea and coastline are simply breathtaking - one can imagine a beautiful bride stepping out onto this pavilion as her husband-to-be gets his first glimpse of his gorgeous girl. 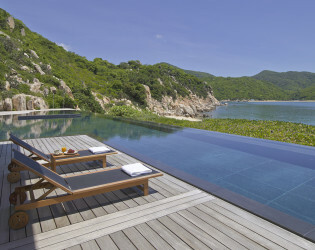 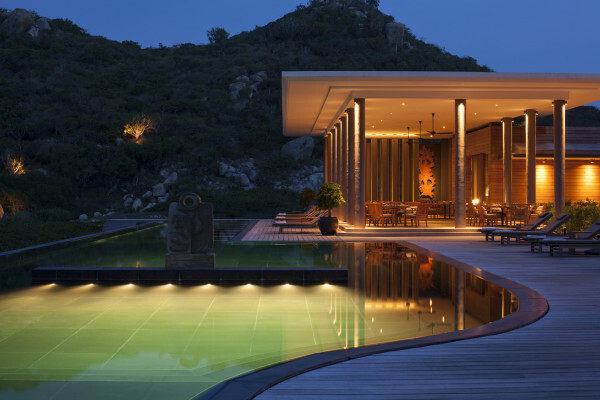 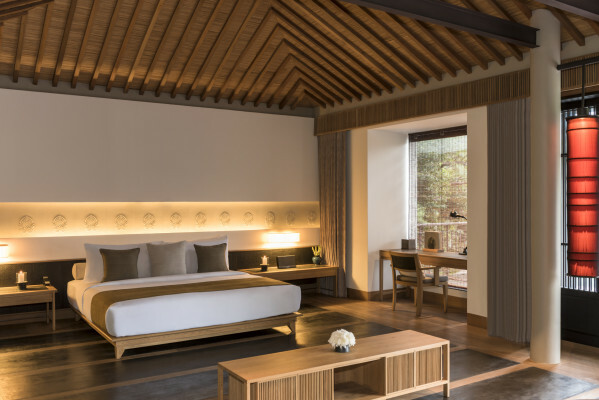 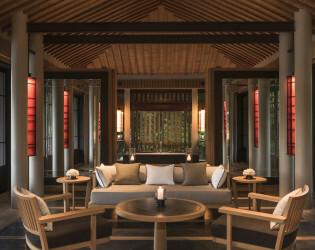 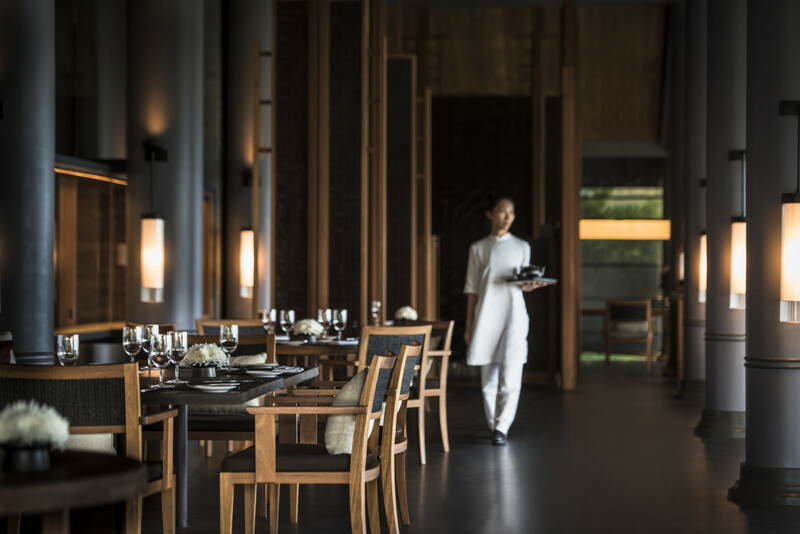 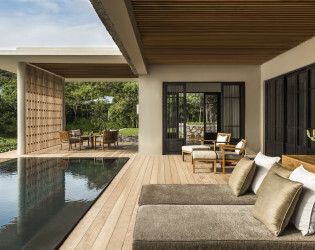 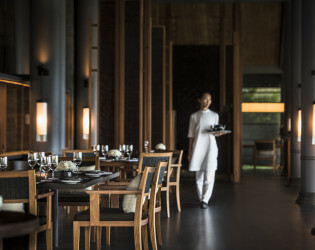 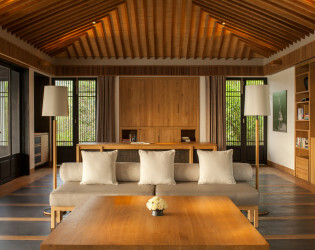 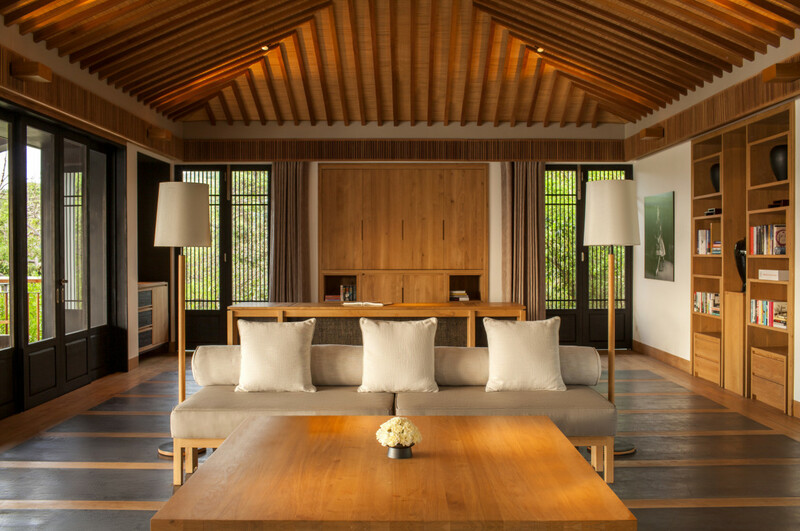 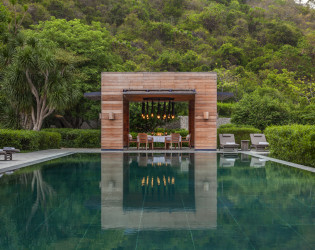 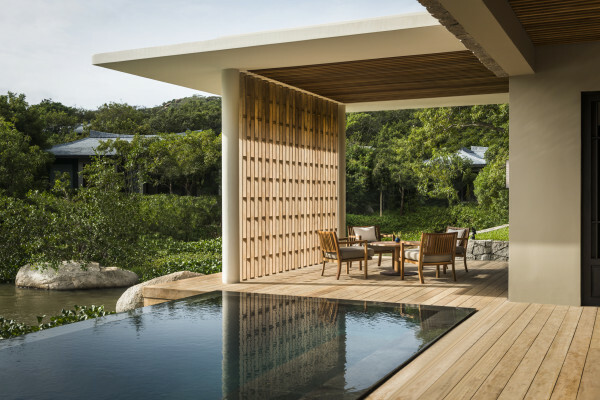 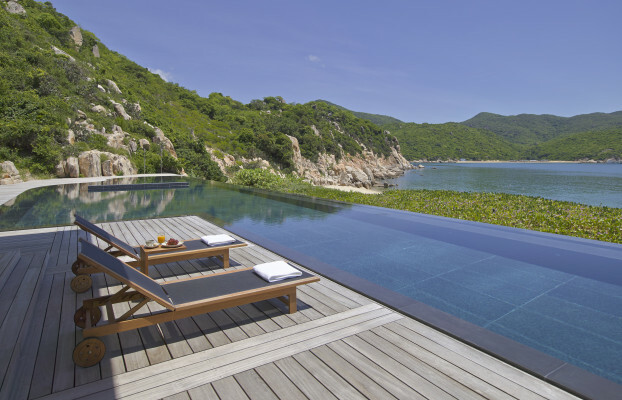 Combining the Sanskrit-derived word for ‘peace’ with noi, meaning ‘place’ in Vietnamese, Amanoi is a contemporary beachside resort and the first Aman resort in Vietnam. 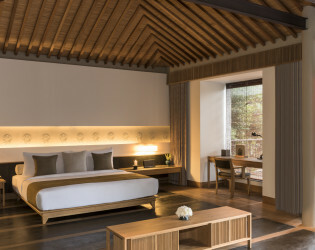 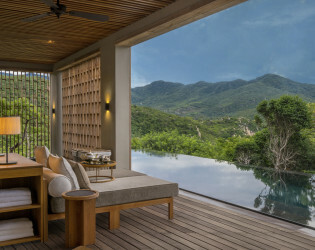 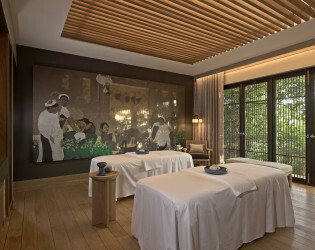 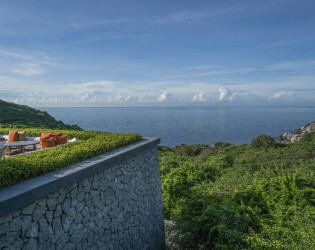 Overlooking Vinh Hy Bay on Vietnam's dramatic central coast, the property is embraced by 29,000-ha Nui Chua National Park and features a lakeside Aman Spa. 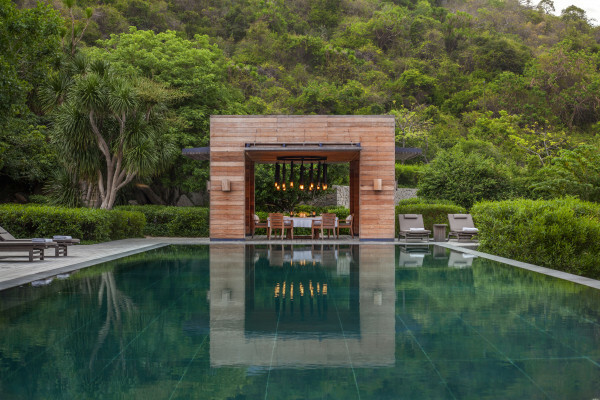 Magnificent views unfold from the spectacular hilltop infinity pool and the Central Pavilion, which houses the Restaurant, Bar and library. Down on the shore, the Beach Club, with its dining area and second swimming pool, overlooks a private swathe of golden sand. 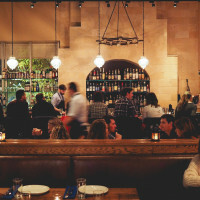 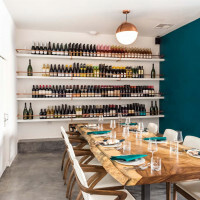 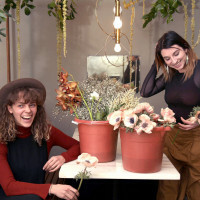 Price is subject to 16.6% taxes and service charge. 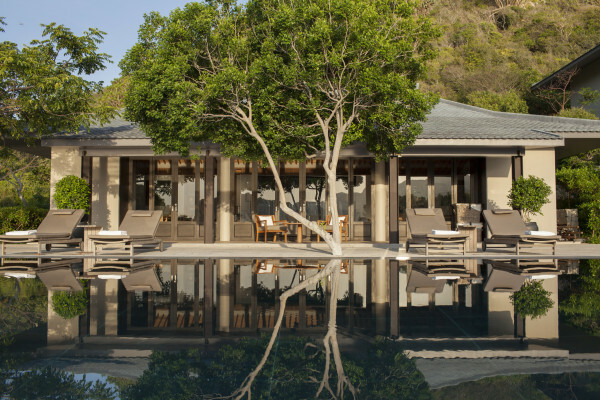 Guest accommodation includes 13 Guest Pavilions, 16 Villas, 2 Spa Houses and 5 Residences – all positioned throughout the sloping mountain. A fusion of contemporary design and traditional Vietnamese architectural styles. 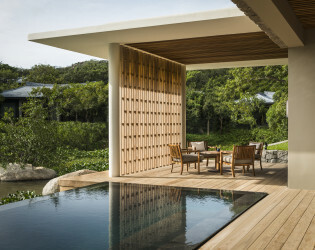 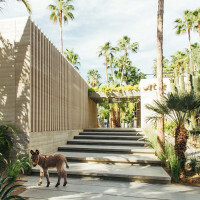 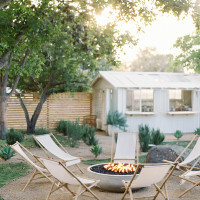 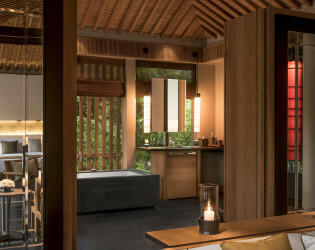 All identical in layout and design, each Pavilion/Villa offers a combined living and sleeping area. 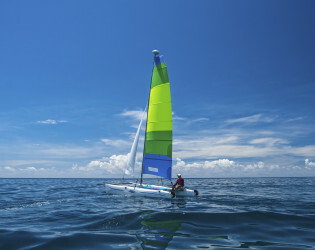 Each location provides panoramic views of the National Park, the lake or views to Vinh Hy Bay and the East Sea. Amanoi is hugged by rolling hills, overlooking picturesque Vinh Hy Bay, situated in Nui Chua National Park, with the coastline looking like it must have done for centuries. 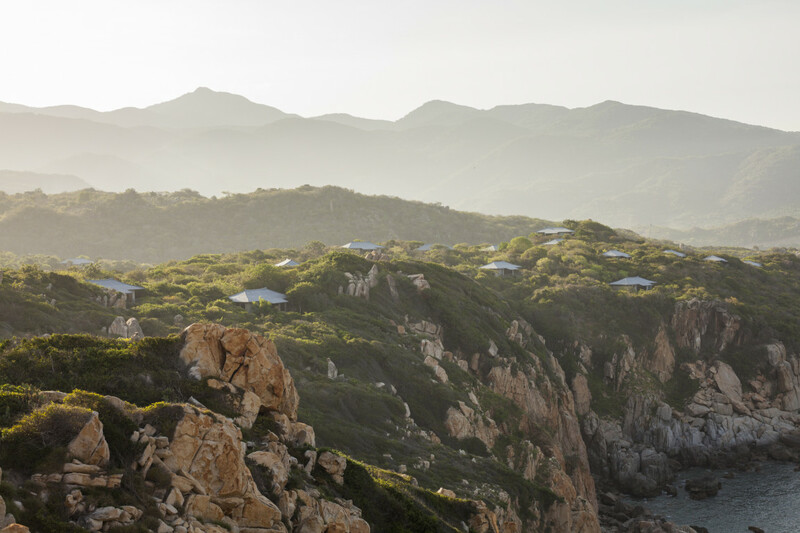 Rocky promontories rear into the East Sea, protecting white smiles of sand and shrugging off dusky green hills. 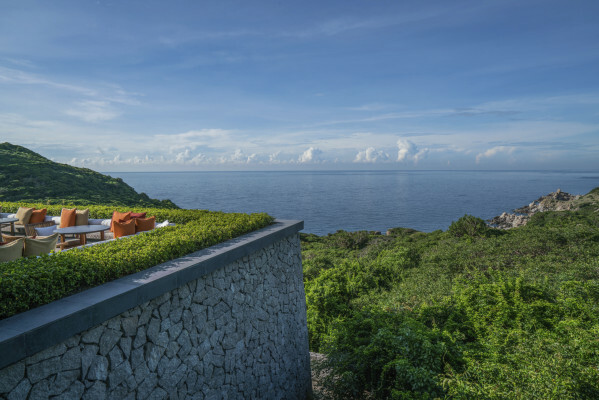 Set high on a wide promontory, Amanoi lies 55 kilometres south of Cam Ranh Airport in a region renowned for its spectacular mountain and coastal scenery. 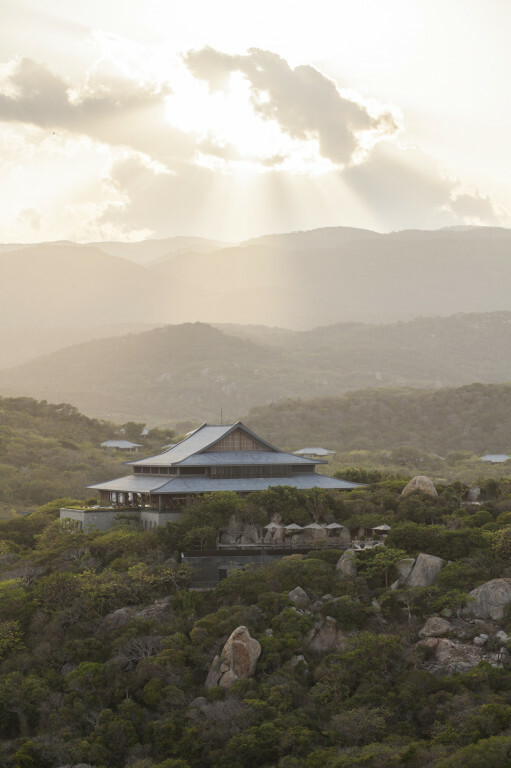 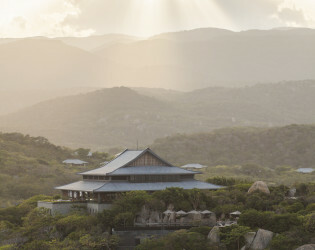 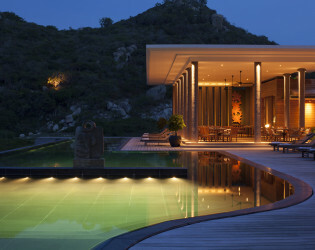 Magnificent views unfold from the hilltop infinity pool and the Central Pavilion, which houses the Restaurant, the Bar and a library. 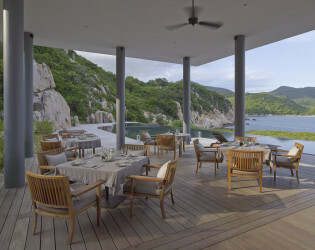 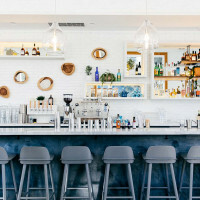 Down on the shore, the Beach Club, with its dining area and second swimming pool, overlooks a private sandy beach, lapped by the coral-rich waters of a marine reserve. Impressive views are a feature of all Amanoi's accommodation, which captures vistas of Nui Chua National Park, the property's lake, Vinh Hy Bay and the East Sea. 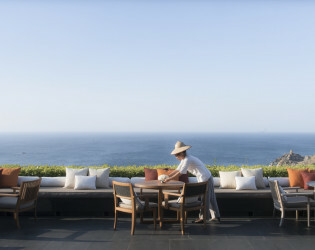 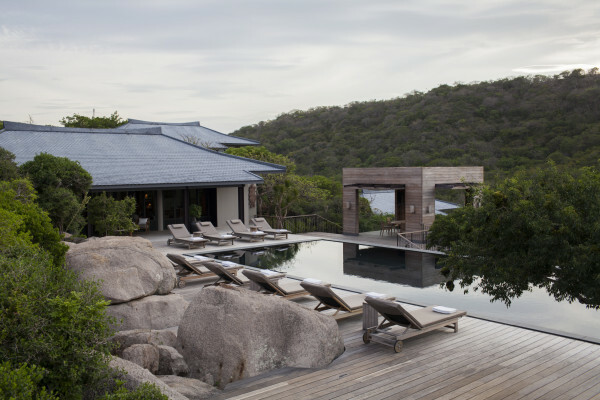 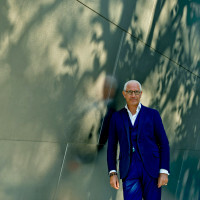 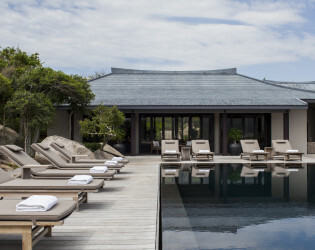 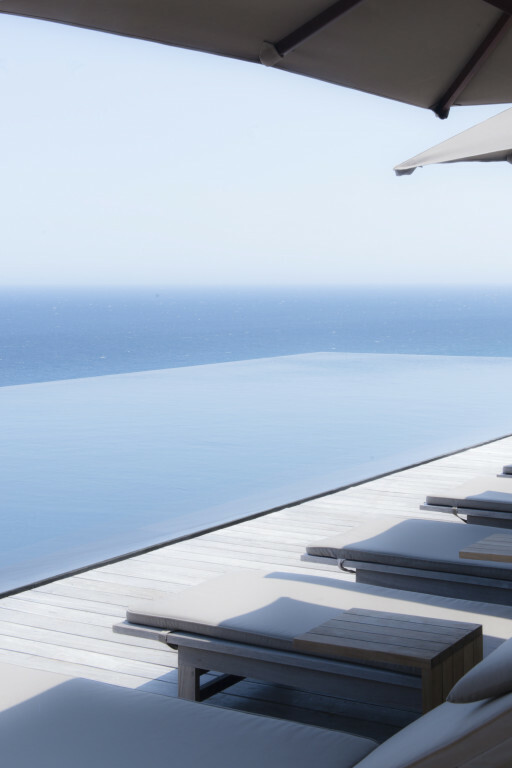 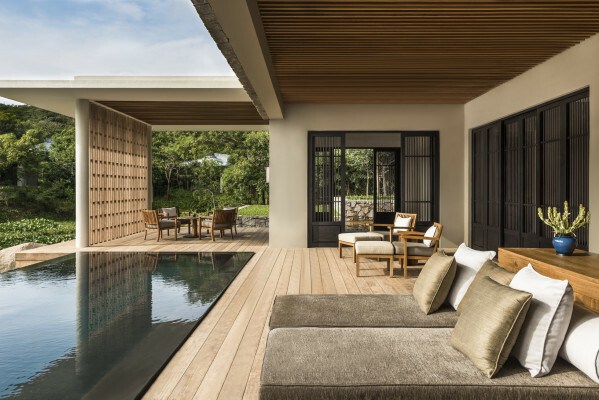 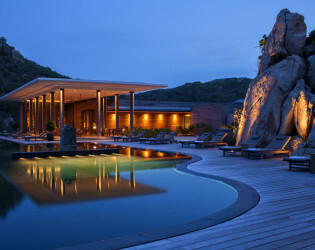 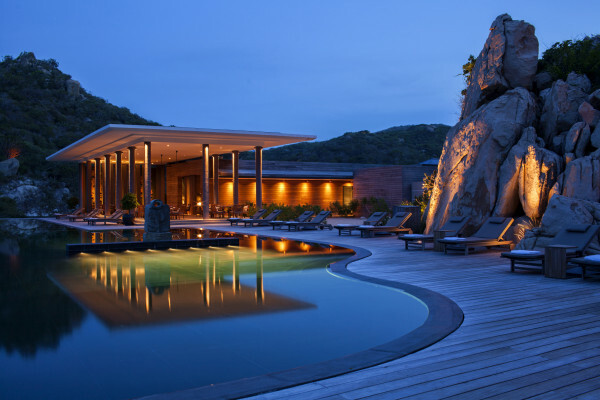 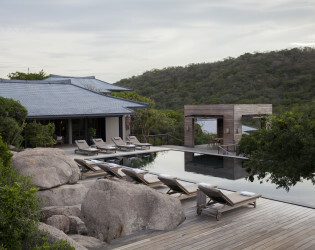 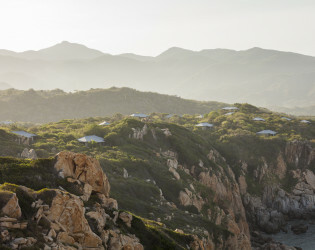 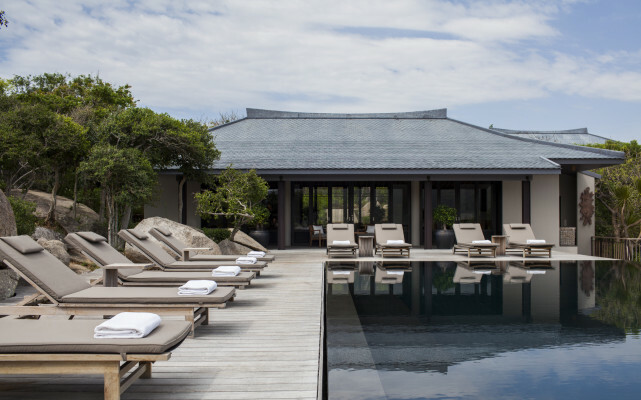 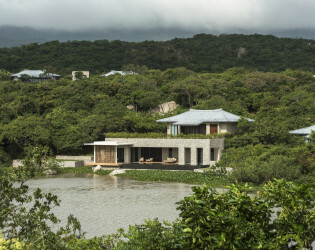 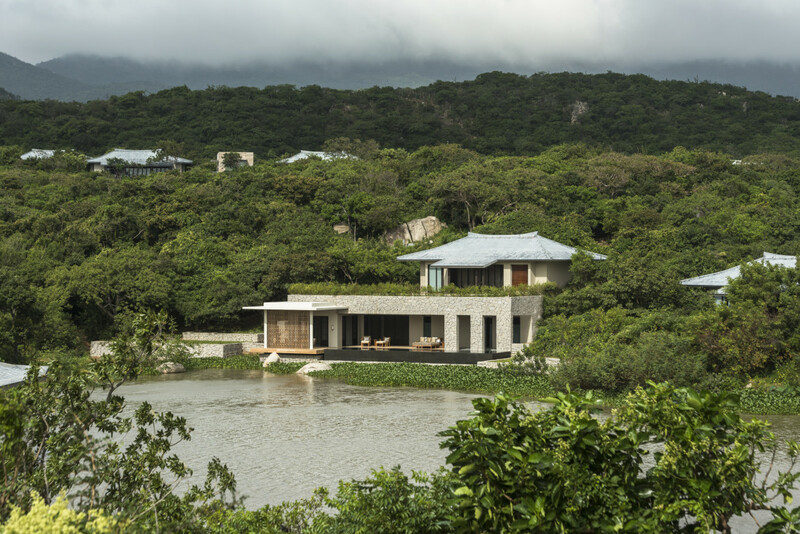 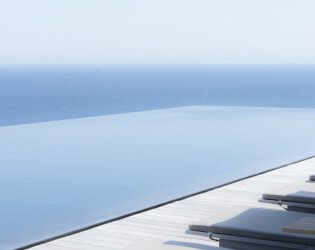 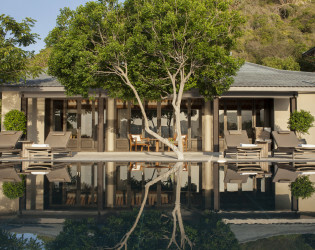 Designed by Jean-Michel Gathy of Denniston International, Amanoi is a contemporary beach resort that encapsulates everything Aman strives to achieve: peace, intimacy, privacy and a sense of place. 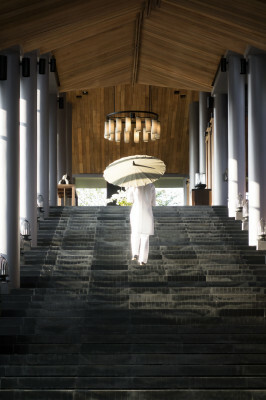 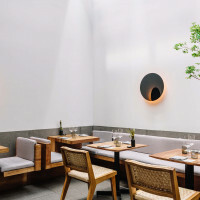 Its essence is Vietnamese - from the curving rooflines peeping above the tree line, to the pathway lamps inspired by fishermen's baskets. 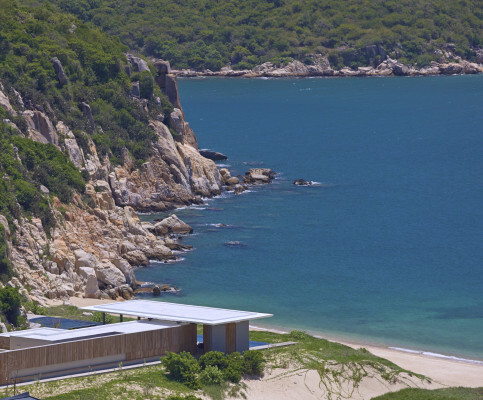 Set in the 29,000-hectare are of Nui Chua National Park, Amanoi went to great lenghts to minimise the reosrt's visual impact on environment, not trying to impose a design on the location, but rather let the landscape dictate where each element fell. 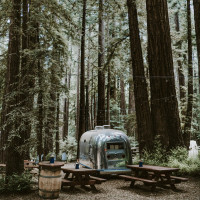 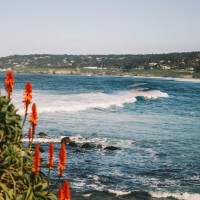 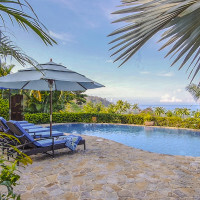 A spectacular setting with rocky promontory, dramatic cliffs, private beach, thick evergreen vegetation and very private and intimate experience. 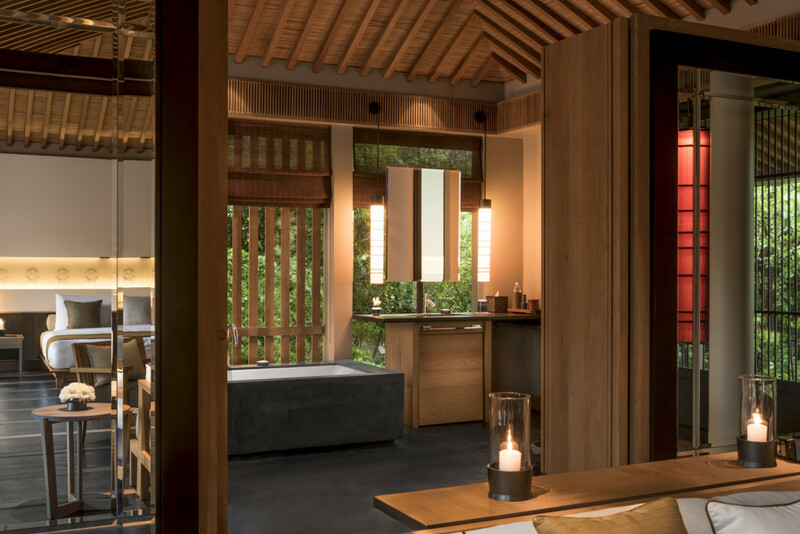 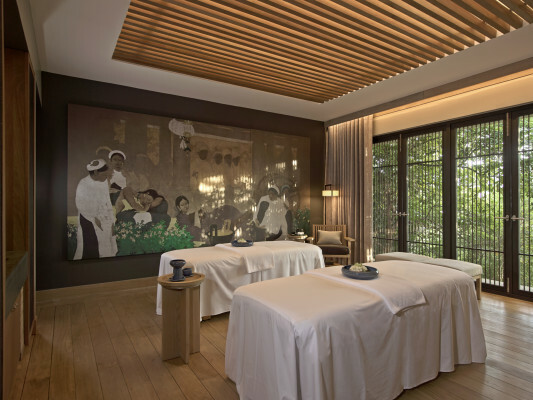 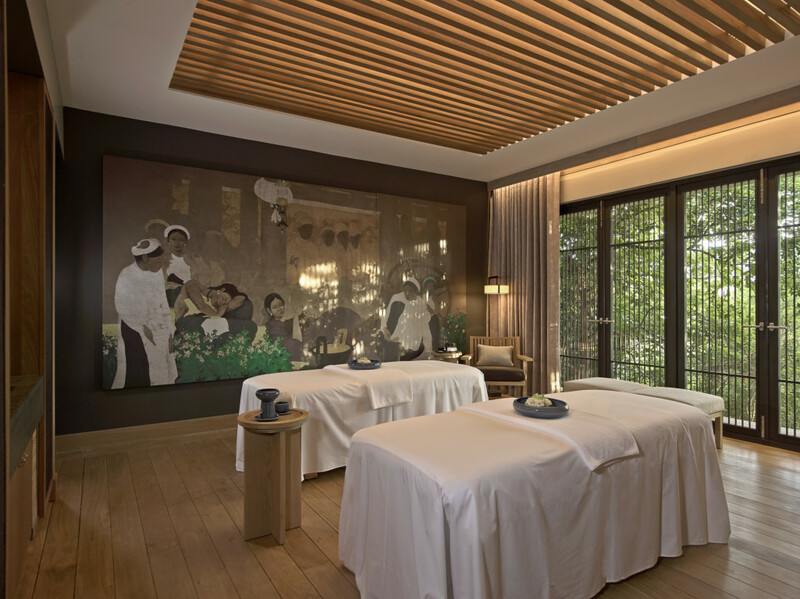 Amanoi's Spa Houses are the very first of its kind in the world, which offer private spa therapist and exclusive spa facilities, including treatment room, steam room, jacuzzi, Hammam or Banya treatment room, infinity pool, dining and relaxation area. 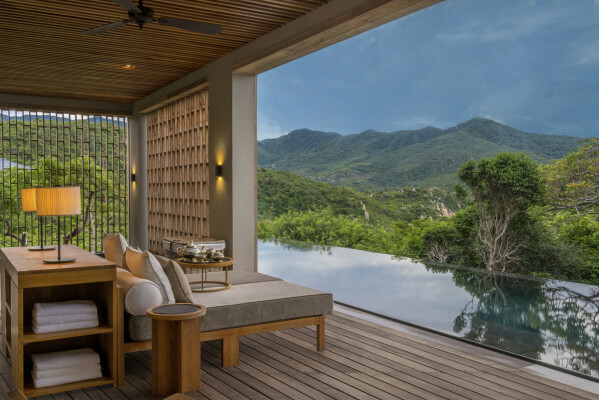 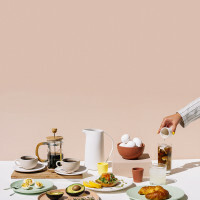 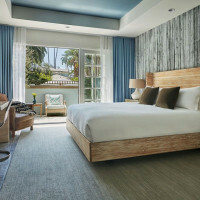 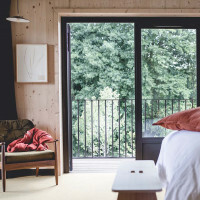 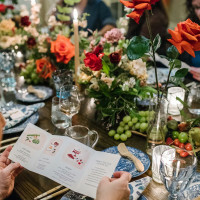 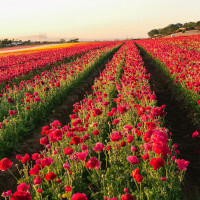 Awards & Notables Travel + Leisure, USA IT List: The Best New Hotels, 2014 Conde Nast Traveler, USA &UK - The Hot List, 2014 National Geographic Traveler, China - 10 New Luxury Resorts in Asia, 2014 Robb Report, USA- 100 Resorts, 2014 Gallivanter's Guide, UK - Awards for Excellence, 2014; 2016 Gallivanter's Award of Excellence - Best Resort and Spa Worldwide. 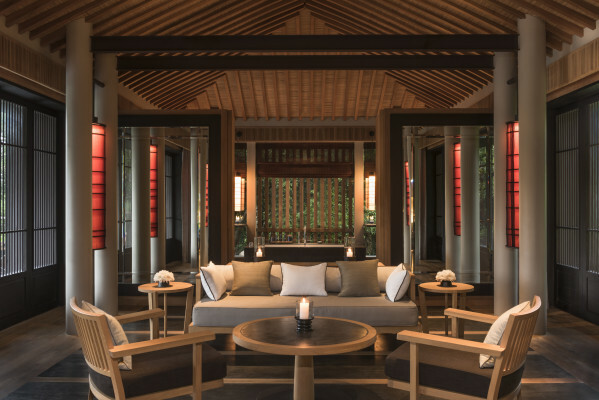 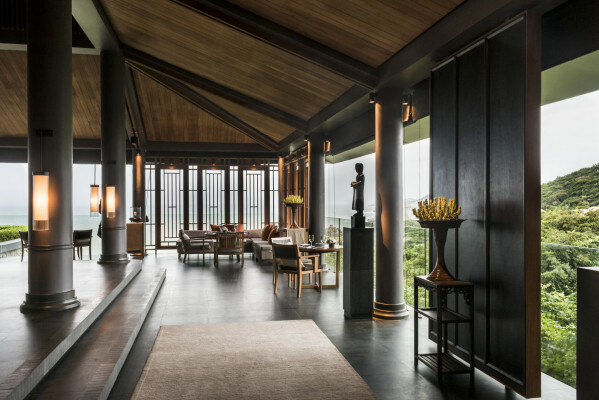 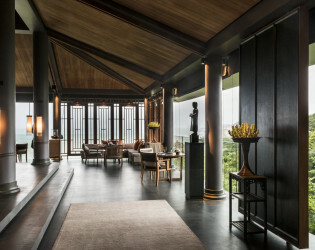 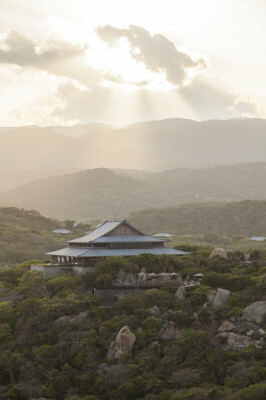 Inspired by a traditional Vietnamese communal hall, the Central Pavilion occupies the hilltop and houses the Restaurant, Bar and an expansive terrace, all making the most of the breathtaking views. 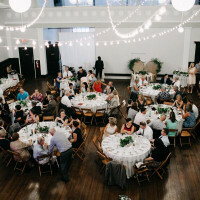 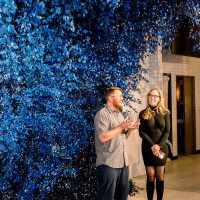 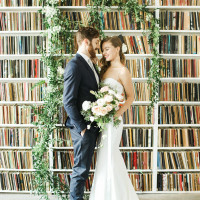 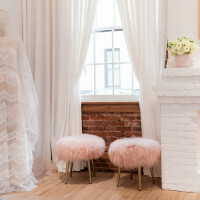 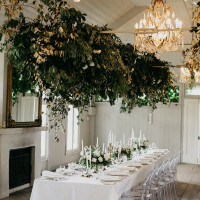 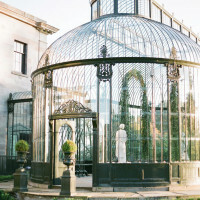 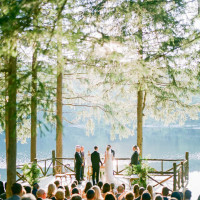 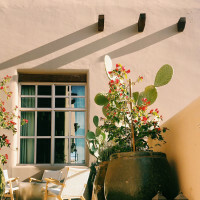 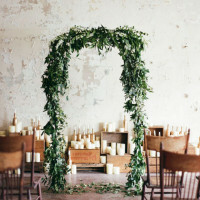 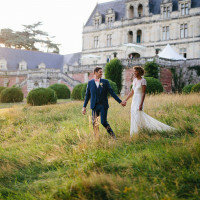 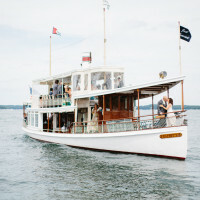 The atmosphere is serene and perfect for a cocktail or wedding ceremony. 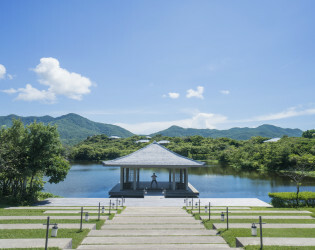 The main spine consists of lawn platforms descending gradually towards the lake and the floating pavilion. 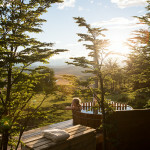 In the background spans the magnificent layers of mountains covered by the national forest. 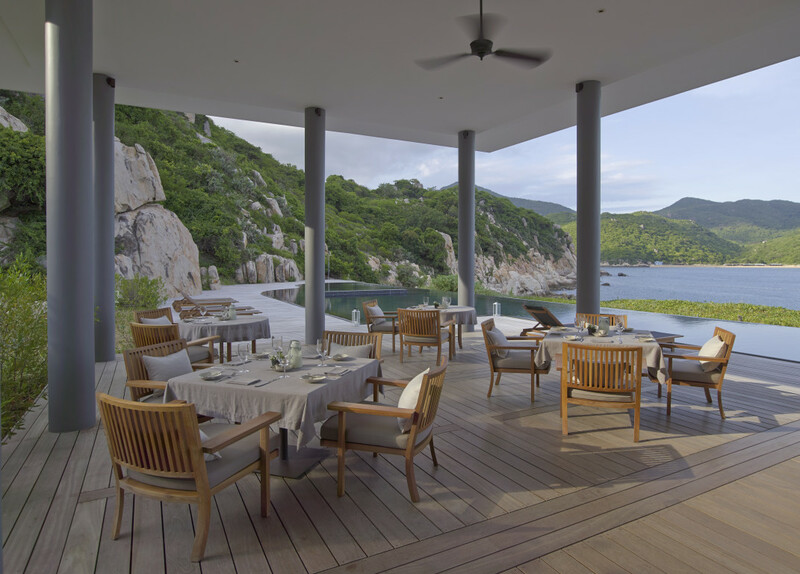 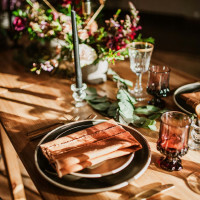 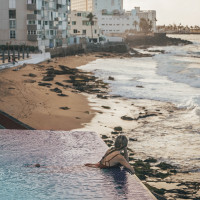 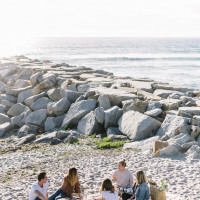 The residence offer a private celebrating location for a small group of close friends and family, with spectacular view to the bay and the ocean, private chef, butler and all services upon request. The Central Pavilion Restaurant features a contemporary designed glass box for dining and lounging with a terrace overlooking the coastline. 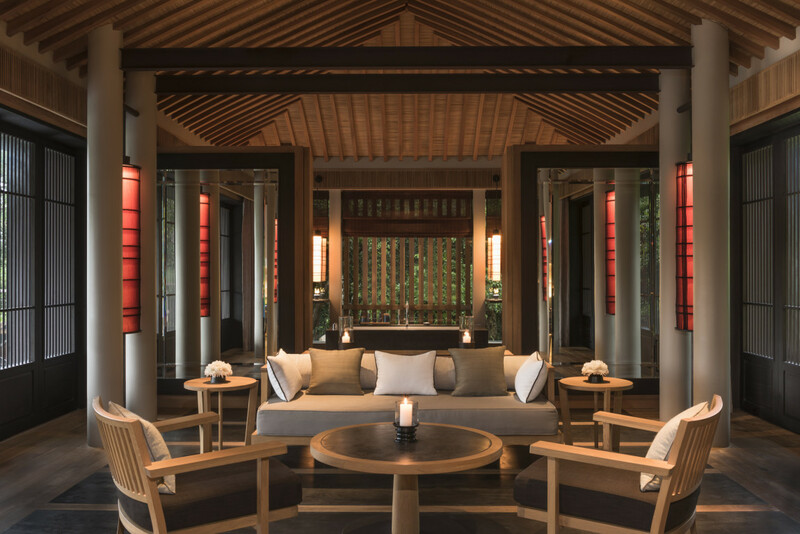 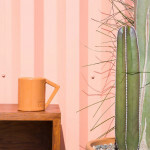 Amanoi's Bar features a collection of photos and paintings by Vietnamese artists with cozy leather chairs inviting a moment of calm for socializing.